My cake was so fun to make! 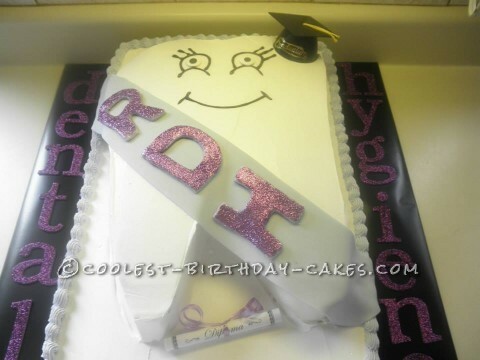 I just graduated as a dental hygienist, and one of my hobbies is to make cakes. I have always made cakes for everyone else but didn’t plan on making a cake for myself – but my family made me one… LOL! Well anyways I made a half sheet cake that was half yellow and half chocalate, for the bottom cake. I then took another pan and made a cake that was butter pecan flavor. I shaped the tooth by freehanding and cutting out the shape. I frosted the entire cake using better cream frosting- it’s more of a whipping frosting but it is delicious, not real sweet and just makes the cake nice and smoothe. The bottom cake you can’t see very well, but I used tip 103 and created lavender purple ruffles around the entire cake. The sash and letters RDH are made out of fondant, use the satin ice fondant it is wonderful. I piped the face and used edible eyes. Everyone loved the cake, and I am so proud of it.